NIA CHARLESTOWN NEVIS — (MAY 11, 2014) The following is the full text of an address made by Deputy Premier and Minister of Health in the Nevis Island Administration (NIA) Hon. 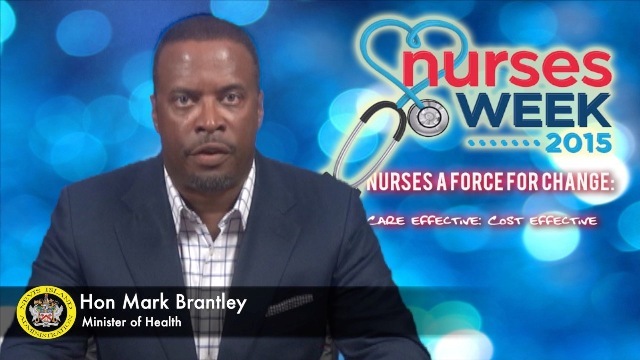 Mark Brantley on May 11, 2015, to commemorate International Nurses Week. Nurse’s week is commemorated annually around the world on May 12th in honor of the birth of Florence Nightingale who is often referred to as the mother of nursing. The theme for this year is “Nurses: A Force for Change. Care Effective. Cost Effective.” This theme places nurses at the center of health systems development, which ultimately translates to the achievement of better health outcomes. The role of nurses therefore is not just limited to that of clinician. It is imperative that he or she is cognizant of the various facets that impact quality healthcare, such as cost effectiveness and resource management, healthcare financing and the rising cost of healthcare which may impact access to healthcare. The Ministry of health is ever cognizant of the many contributors to rising healthcare costs including increased life expectancy, an increase in the incidence of non-communicable diseases and increasing costs of medicines and technology. The demand on the healthcare system is exorbitant particularly as it relates to human and material resources. By building the capacity of nurses in the area of strategic planning and management for example, nurses can be more effective in the execution of their duties. We are well on our way to achieving literacy in these areas as many nurses have received and will continue to receive training in health leadership and supervisory management among others. The contributions of nurses and other healthcare workers is of critical importance as we work towards the realization of universal healthcare. It is important that adequate healthcare workers in the right mix are available to ensure optimal service delivery. In the federation of St.Kitts/Nevis we have trained our nurses for several years at the Nursing College in St.Kitts. We are pleased to have taken a mammoth leap forward within the last year or so, and now offer baccalaureate level training for nurses at CFBC at extremely affordable rates. The upgrade of the nursing programme also brings with it a state of the art nursing skills lab-the best in the OECS. By offering this level of training locally, we are doing our part to address the global nursing shortage while ensuring access to healthcare for all. A higher ratio of nurses to patients at hospitals has been proven to result in lower mortality rates. A greater number of nurses at health institutions also results in decreased workload and positive patient outcomes. My government envisions that we will not only see positive health outcomes at our institutional health facilities, but our public health institutions as well. Nurses at the health centres in the country interact with our people at these facilities and a host of others as well including workplaces, schools, community centres and households as well. This extensive reach allows nurses to not only impact health policy, but also policies related to education, labour and community development to name a few. As nurses continue to work together to produce a positive change not only to our healthcare sector but to our economy, we the Nevis Island Administration will continue to provide support to the members of this noble profession. We understand the importance of being cost effective and congratulate the International Council of Nurses for adopting such a relevant theme which can be applied not only in the area of nursing but in other fields as well. We encourage young people, both male and female, to consider nursing as a viable career choice and we as a Government stand willing to assist financially with studies to ensure that a local cadre of nurses is available to the people of Nevis. I take this time to salute all our nurses and thank them for their continued service to the Nevisian public. With those sentiments, it gives me great pleasure to now declare Nursing Week open.